Exceptionally easy to use, with a useful range of features including 2 power settings. 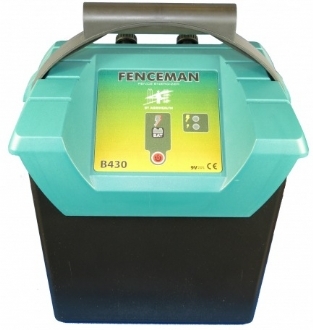 The B430 is capable of powering longer electric fences of up to 3 km. It can also give a a meaningful shock to more "challenging" livestock. Turn the energiser to the 'high' setting to train your animals and give them a good initial shock. Once the animals have learnt not to touch the fence, you can turn the energiser down to a lower setting to preserve battery life. Because this unit is so light and compact even with the battery inside, it is ideal for taking to overnight shows where a quick temporary fence is required. This energiser is made in Ireland and has a 2 year warranty. With the high power setting the B430 energiser is a very useful unit. To conserve battery life we sugest customers run the unit on high power for a week so the livestock learn that the fence bites, then switch to low power to conserve battery life.